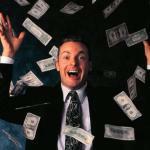 Money money in the money. 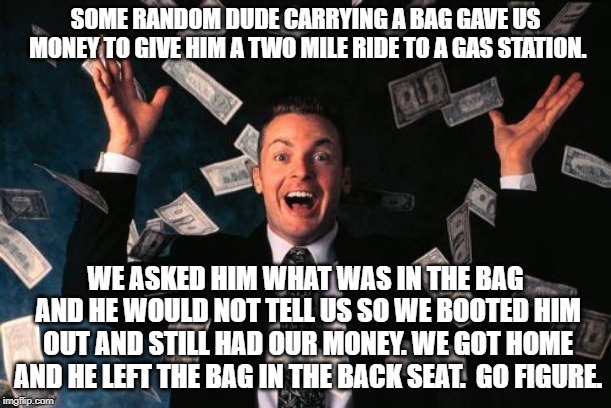 SOME RANDOM DUDE CARRYING A BAG GAVE US MONEY TO GIVE HIM A TWO MILE RIDE TO A GAS STATION. WE ASKED HIM WHAT WAS IN THE BAG AND HE WOULD NOT TELL US SO WE BOOTED HIM OUT AND STILL HAD OUR MONEY. WE GOT HOME AND HE LEFT THE BAG IN THE BACK SEAT. GO FIGURE.